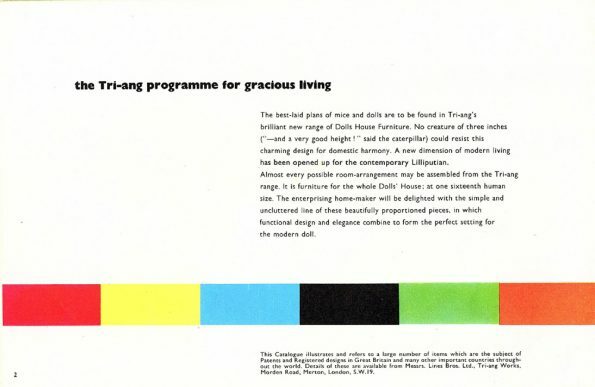 The Triang Spot-On Range of Furniture in the list below was produced from 1960 until approximately 1964. 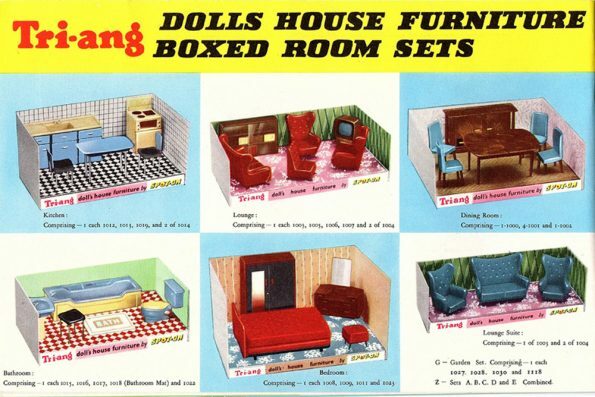 In addition to the Spot On range there was also the Dollie Home range from 1962, comprising mainly of room sets and larger furniture pieces such as the filing cabinet. They were not cheap pocket-money toys and probably added to the reason for their short production period. In 1965 it was later rebranded as the Jenny’s Home Range, in conjunction with the ‘Homes and Gardens’ magazine. Jenny’s Home range was produced until 1970. The furniture was made in the Belfast factory which had been producing die-cast toy vehicles since 1959. The furniture in 1/16 scale, was made of a rigid plastic and [zinc mazak] metal, and have survived well for their age. Reflecting the style of the 1950’s They would not pass Safety Standards today, as the legs on chairs and cabinets would be quite dangerous for a small child. 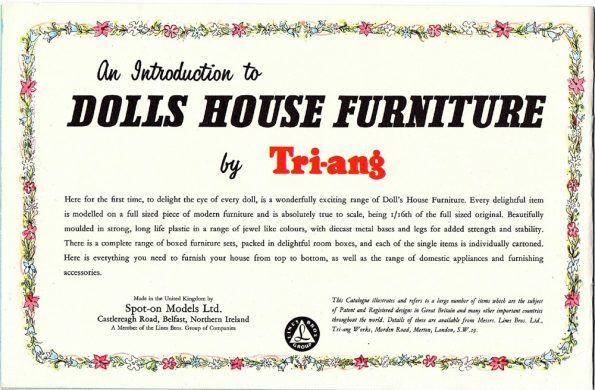 The best-laid plans of mice and dolls are to be found in Tri-ang’s brilliant new range of Dolls House Furniture. No creature of three inches (” – and a very good height!” said the caterpillar) could resist this charming design for domestic harmony. A new dimension of modern living has been opened up for the contemporary Lilliputian. Almost every possible room-arrangement may be assembled from the Tri-ang range. It is furniture for the whole Dolls’ House; at one sixteenth human size. The enterprising home-maker will be delighted with the simple and uncluttered line of these beautifully proportioned pieces, in which functional design and elegance combine to form the perfect setting for the modern doll. 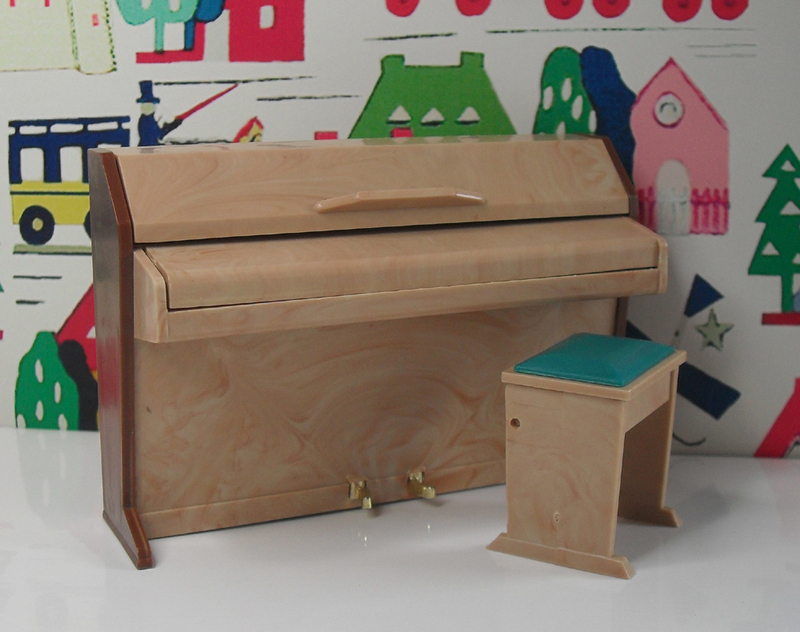 The links below are to the Triang Furniture that I have in my collection. Not a very big collection at the moment, but some interesting pieces. The sub links show how a piece of furniture changed under the rebranding to the Jenny’s Home range. Some of the Jenny’s Home range has been listed using either the prefix J or JH.